Readers of all ages will be inspired by this beautiful picture book memoir co-written by the grandson of Mahatma Gandhi. In Grandfather Gandhi, Arun Gandhi recalls leaving South Africa to live near his grandfather in an ashram in India. The first person narrative allows readers to see the story from the point of view of a young Arun who is worried about living up to his family's famous name. Turk's gorgeous, mixed media illustrations use watercolor, cut paper collage, cotton, yarn, pencil and tinfoil on a background of paper stained by tea. 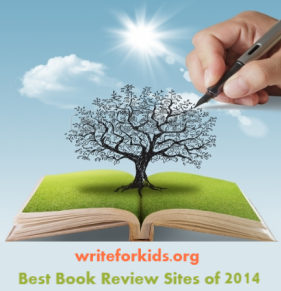 The illustrations effectively capture the emotions of the story. As Arun has a difficult time adjusting to life in India, the illustrations change to reflect his frustration. When Arun and his grandfather share a meaningful moment during a walk, Turk illustrates their shadows cast over a golden landscape. The power of the story comes when an angry Arun lashes out at his playmates during a soccer game then seeks out his grandfather for comfort. Gandhi shares an analogy that anger is like electricity, and we have the ability to choose between turning our anger into lightning or a lamp. "Arun, we can all work to use our anger, instead of letting it use us." 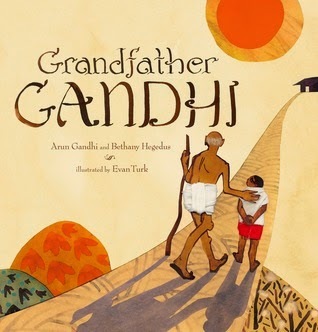 Visit the Grandfather Gandhi website to access discussion guides, a reader's theater script and to view a video interview with the author and illustrator. Click here to view the Grandfather Gandhi book trailer.